Our flexible front-end JS SDK helps build streamlined registration solutions and rich consumer experiences. Our REST API powers smart data centric services and applications. Integrate our deep consumer analytics into your own platform. If you want to authenticate users socially and gain deep data insights, you'll need to set-up your social applications. The 'AE Connect' AEJS SDK is a straightforward, powerful and highly flexible authentication tool. Get going quickly with an 'out of the box' approach, or easily integrate with your existing code and design. This isn't a 'widget', it's a framework. 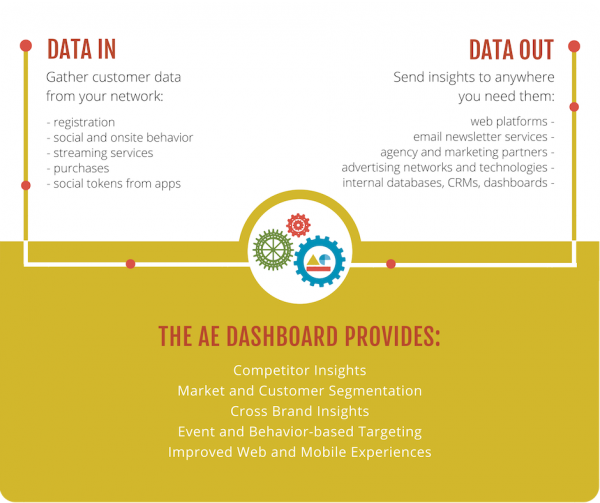 AE Grid allows businesses to better understand their acquired customers through real-time monitoring of social and on-site behavior which is collated and presented back as activity feeds, unique customer profiles and cross-brand analysis. Use the REST API to pull this data into your own applications and dashboards, or to feed additional signal into the system.